These memories written by Frank Fried and published in the latest issue of Against The Current. My contribution focuses on the personal relationship Lester Rodney and I had over the last 30 years of his life. I first met Lester when I moved to California in 1979, though I remember hearing all about him long before from mutual friends who begrudgingly acknowledged that in spite of other problems they had with the Daily Worker, it had a great sports page. So even though Lester has been recognized for his individual accomplishments, he and the Daily Worker are forever linked. Lester and I became good friends through a series of interlocking personal relationships — with Stan and Mary Weir, for example, longtime socialists with a history in the Trotskyist movement, and with Jimmy Weinstein, the publisher of In These Times in its early beginnings when it sought to be a catalyst for a newly emerging socialist democratic movement. Lester described himself (and I agreed) as a democratic socialist, with a commitment to socialism. For me, the struggle I was involved with inside the Socialist Workers Party and the subsequent formation of the American Socialist in 1954 revealed that the party-building forms and dogmas that were part of my own tradition were actually more of a hindrance to the formation of a democratic left. Lester’s approach to this notion was non-sectarian and included being open to the ideas of the far left. The conflicting origins of our socialist beliefs eventually narrowed. And our mutual re-assessments based on life experiences, from these sharply divergent political tendencies, provided us an even closer bond of friendship that endured until his death. Lester was unapologetic about being radical and proud of the work he did providing the Daily Worker a first-class sports page with a reputation far beyond the political influence of the newspaper itself. However, he was inclined to be cautious about revealing his political associations as well as his accomplishments. In fact, I felt that he was reticent to speak of his role and that of the Daily Worker in the integration of baseball because he had come to regret his blind, misplaced faith in the Soviet Union and the coverup of the crimes of Stalin. And in several of our many discussions on the subject, Lester told me how embarrassed he was by the fact that he failed to recognize the crimes of Stalinism until the 20th Congress revelations by Khrushchev in 1956. Of course, history has rendered its verdict on Stalinism in the Soviet Union. I believe that a truthful rendering must also recognize the significant role of Lester and the Daily Worker in the struggle to desegregate baseball. It would be a travesty if history forgot to mention the man who did so much to integrate baseball, and the paper that he wrote for. Lester’s comfortable anonymity became impossible to maintain once his past associations were “outed” during the 1997 50th anniversary of Jackie Robinson’s appearance as the first Black player in major league baseball. Lester was sought out by the press including ESPN, CNN and other major news outlets, which treated him favorably. Surprised by the newfound notoriety that highlighted his role in integrating baseball, Lester was quietly gratified that he got some recognition. The last major interview I knew about was in 2008 on the 70th anniversary of the Schmeling-Louis fight. Lester was the last surviving sportswriter in attendance. Never one to seek publicity, neither was he shy about sharing his experiences honestly if he was approached. Lester was a keen observer of the contemporary sports scene, especially as it relates to politics. We had numerous discussions about it. There was one conversation in particular that stunned me. I asked Lester which ballplayers were sympathetic in the 1930s and ’40s to the radical movement. His answer was none. I broadened the inquiry to include all sports figures and he answered again, none. He mentioned that Red Rolfe, a Yankee third baseman, was an avid New Dealer, and that that was about as left as anyone he could name in sports. That answer shocks me to this day and confirmed my belief that the radical movement may have romanticized a bit the response of American society to the crisis of the 1930s. I felt that if society, especially the working class, had been looking for radical options, this would have expressed itself in the popular world of professional sports. Lester neither agreed nor disagreed, but commented that most athletes came from small towns and were not inclined to be familiar with, let alone engaged in politics. I never thought that was an adequate response. Unfortunately, for as many times as we had that discussion, we never fully completed our conversation on the meaning of the disconnect between the world of politics and the world of sports. Lester was 16 years my senior and we enjoyed a warm, personal as well as a fiery, yet congenial, political relationship. Lester enjoyed playing bridge, which in the early years of our friendship, we played often. He was also an avid tennis player. We played a lot of tennis matches, and even though the rivalry began when he was 68 and I was 52, I never won more than four games in a set, and that only once. Lester paid attention to his physical condition, which led to his longevity on the tennis courts. He gave up his racket at the age 94, whereas I had given up mine long before. The last time I saw Lester was several months before his death. He was at my home for an event benefitting the South African socialist magazine Amandla. I have lost a good friend, and those who struggle for social justice anywhere have lost a soldier who was a general in his field when it counted. Lester was a long-ball hitter. It’s Never Too Early For Independent Politics! The economic crisis along with the reaction to it by the Obama administration and the Congressional Democrats are preparing the ground for some vigorous independent campaigns in the midterms and then in 2012…if the challenge is met. Buckeye Socialist Dan La Botz is meeting the challenge and has a new website up for the November Ohio Senate election. Dan, being a serious guy, has gotten an early start. The site has event announcements and a slew of ‘issues’ statements up; further updates are promised. Dan is running as an proud and open socialist – a real one, not the confused epithet of the right- attempting to reclaim the term. In my opinion, part of the reason “socialist” can be currently used as a term of obfuscation is that the socialist left haven’t embraced, and helped define, “socialism” enough. Here’s to Dan for naming the alternative and placing workers’ issues at the center of his campaign. We’ll be keeping an eye on this campaign and hopefully we here in Michigan can lend a hand, Ohio is just down 75. Here’s Dan speaking on “Who Owns Cincinnati?” breaking down the power structure of The Queen City. Dan is a skillful activist and educator; bringing this kind of perspective to the Ohio Senate race is going to be a real strength. Ohio has felt the recession as hard as any place, like the rest of the Rust Belt it never recovered from the last recession(s). My guess is that the candidates running from The Two Parties to replace the retiring bore Voinovich will avoid debating Dan like the plague. They would lose and the last thing the Duopoly wants in times like these is for any alternative to be posed. It will take a strong voice to get heard. Free the Scott Sisters! Today is a “day of blogging” to support the campaign to free the Scott sisters. The Rustbelt urges you to raise this issue and get involved. The more you read, the angrier you get. What an outrage! It must be unbearable for the family; we hope that Gladys and Jamie will be reunited with them soon. The Scott sisters are sadly not alone. While their fate is especially egregious, hundreds of thousands if not millions of people face similar tales of injustice in capitalist, racist America. The text below is a flyer from the campaign. When I was growing up in Cincinnati a good day was school skipped and a matinée at The Movies, a great repertory cinema downtown. This was the kind of theater that showed, along with first runs, Quadrophenia at midnight on Thanksgiving or Aguirre: The Wrath of God on a Monday afternoon. It was 1986 and I saw an ad for Akira Kurosawa’s Ran in the paper. I knew it was based on Shakespeare and was set in feudal Japan (or among samurais as I would have thought then) and not much more. I had certainly never seen a Kurosawa movie and probably not many foreign films either. I was blown away (the colors! the clouds!) and skipped school several more times during the run to see it (though one, admittedly, only served as space for a teen-age make-out session). To this day the film’s score will stop me in my tracks. I began to proselytize for the Church of Akira almost immediately. All that skipping was dooming my high school career, but I was coming to reject such a career anyway. Like most teens I wanted to get away, to see the world. Politics or artists like Kurosawa were capable of opening far more vistas to me than the Cincinnati Public Schools, where young people were warehoused, ever could. Each first viewing of a film contained revelations, repeated viewings more. I would end up seeing most of his catalog several times, often hitting the rare video store in the college neighborhood that carried international fare with a good friend. Though our preference for Kurosawa’s periods differed, our appreciation of the Master grew with each new discovery. We still discuss Kurosawa all these years later. We probably always will. I may be one of the few people with a Kurosawa tattoo. Years after Ran came out I was working at a tattoo shop and hanging out one evening with an artist, a gifted artist, and we watched Ran twice in a row together all the while he was sketching with chalk and getting lit. At the end of the night he felt compelled to tattoo the picture he saw. I couldn’t refuse; the moment demanded it. I proudly wear his artwork now, it’s a masterpiece in itself. Later on, traveling through Kyushu in Japan I hiked the volcanic Mt. Aso where some of the stunning battle scenes of the film were shot. A great experience. My two most prized possessions are original Japanese posters of Red Beard, a wonderful film about a doctor to peasants starring the incomparable Toshiro Mifune, and Ran. I could go on, such has been my passion for Kurosawa’s films. In no order here are my top ten Kurosawa films: High and Low, Ran, Yojimbo, Stray Dog, Red Beard, Dersu Uzala…wait, this isn’t working. Looking at a list of his films, I can’t choose. An artist that creates not a single masterwork but many, and in such different periods of a career and life, should be viewed as a whole. Kurosawa’s development, from early optimism (when he joined the Proletarian Artists League and was a fellow traveler of the Communist Party) to the sorrowed pessimism of his twilight, is a single journey. One that has to be taken in its entirety if it is to be fully appreciated, to accompany us on our own journeys. And a what a beautiful journey it is! Kurosawa first painted many of the scenes that would populate his films. Nearly every frame is exquisite, some scenes produce awe. His later action sequences are perfectly realized ballets, but ballets of blood; spellbound, you are forced to watch the horror. They are the exact opposite of, Saving Private Ryan because there are no heroes, only a writhing mass of victims. His early action sequences are as masterfully wrought, but are also imbued with a sanguinity he would come to lose. The final battle in the Seven Samurai is still unequaled in emotional intensity and unlike later Kurosawa in this battle there are heroes. You don’t just root for the villagers, you stand with them, sharing their combat. The images conjured by Kurosawa strike deep and remain with you. There are silences in Kurosawa, the images acting as metaphors for feelings we don’t quite have words for. A relatively simple scene in Kagemusha in which a priest opens a window to frame the snow and mountains outside is jaw dropping in its precision and elegance, but it is the emotions conjured that haunt. I find Kurosawa to be such a sympathetic person. Kurosawa was the most human and personal of directors; it’s why he translates so well. He was also remote, though I’ve never found him aloof, at least as an artist. In some ways his personality is totally modern; the alienated man. Kurosawa was an artist whose work will long be a reference for a century he helped to define. That we should be so selfish and so self-destructive was a deep disappointment to Kurosawa. His personal life contained all of the tragedy and despair inherent to this mortal coil; in the early 70s he slashed his own throat and wrists. As a young man Kurosawa’s brother Heigo would succeed in committing suicide. That an artist of such gifts would not want to live; such is the human condition. In work like Ikiru he focused on the individual asserting their humanity, the assertion being a confirmation of it. In his later years his views of our species soured. He was tormented by the threat of nuclear annihilation and our war against nature; it invaded his dreams. Nightmares he shared. I wouldn’t dare to write a review of Kurosawa or attempt to place him culturally more than I already have. Others have done that and will do that way better than I, who am just a big fan. If you’ve yet to enter the world of Kurosawa or have only just visited, you could do far worse with your time than investigating this giant of 20th century art. The mirror he holds up may reflect more darkness than light, but it is the light that allows us to see in the dark. Below is a lament and an affirmation, the watermill sequence from Dreams. An old man rues that in destroying nature we are destroying ourselves, that the light of our cities prevents the darkness needed to see the stars. A funeral procession follows, but it is a joyous celebration. Youtube does no justice to Kurosawa (he filmed for the screen). Most of his films have been restored and released on DVD, the Criterion Collection being the place to go. To The Maestro on his one hundredth birthday, long will he live. Up north it’s the thinning ice at the edge of glacial kettle lakes that gives the first hint that spring is on the way. I spent the weekend on the other side of the dividing line between the southern deciduous forests and the mixed forests on their way to becoming boreal on the north shore of Superior. Anyone who has traveled north in Michigan knows that change. There are plenty of woods, but “climax forest” might be the most enticing phrase in the ecologist’s lexicon; it’s rarity testament to the rapaciousness of the continental conquest. Very little is left of the towering white pines, jack spruce and hemlocks that covered Michigan and whose exploitation created the timber barons whose fortunes bankrolled Michigan’s nascent auto industries a century ago. As impressive as the remaining stands are, with their open floors of moss and pine needles and their 100 foot high canopies that allow only thin shafts of light, they exist as giant museums of an eco-system largely gone. One doesn’t replant a climax forest; it takes centuries to develop (and minutes to destroy). 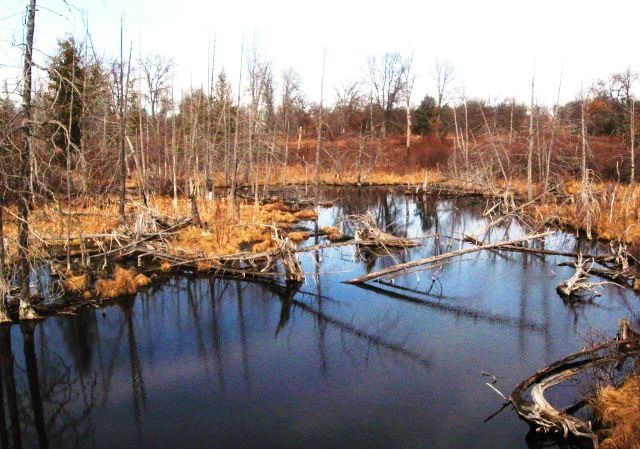 The East Branch of the Au Sable is not like southerly rivers; it is home to otter, beaver, mink and ermine. At places the banks are think with their tracks, the rivers thick with trout. Bogs and marshes hug its course. A good place to spend the weekend, an even better place to spend a week. Alas…it’s Monday morning and the weekend is over. I watched Ralph Nader on Amy’s show today with Dennis Kucinich and was struck by how much I miss Peter Camejo. Ralph, simply by virtue of standing outside the duopoly, has way more credibility with me than any Progressive Democrat and gently took Dennis to task for his capitulation. Camejo, Ralph’s running mate in 2004, was significantly to the left of Nader and one can imagine what he would say in a debate with Dennis. To Nader’s credit, he knew Peter’s political principle and ability were strengths and proudly shared the ticket with him. It was Peter’s presence that convinced me, and many others, to work for that campaign. Peter was seeking a road to working class independence and power; he was schooled by a Marx he never repudiated. He knew the enemy was imperialism and that capitalism’s ills were inherent, the system irreformable. Even if I might not have agreed with Peter on any number of things (and some things quite strongly), his consistency with his own positions and the courage in which he defended them stands in sharp contrast to those like Kucinich who bargain theirs away. One can imagine pretty clearly what Peter Camejo would say about the Obama administration and the current quandary “progressives” in and around the Democrats find themselves in. We need not imagine everything though. These videos, recorded just a few months before Peter died in 2008 as the Presidential election was in full swing, give some indication what he might say now. Parts two, three and four here. Peter Camejo, Presenté! I’d call him a sell-out, but once a pattern is established….Principled peacenik and pacifist extraordinaire supports pro-war candidate Kerry and then drone-war candidate Obama (and urges others to do likewise). Principled supporter of single-payer and previous denouncer of corporate evil supports Obama’s Health Care Industry Promotion Package (and urges others to do likewise). My guess is that even without the attention lavished and the Air Force One jaunts Dennis would have found his way to the corporate bed, he just wanted the romance of a little dance first. Remember 2004? He danced all the way until the eve of the convention before laying down. It’s his M.O. Once again (and as predicted on this blog), Dennis Kucinich proves his role as the “progressive” who corrals lefties into supporting the neo-liberal, imperialist Democrats and the political prison of the two-party system. Let’s hope this time he is ruined by his game. Boo. Hiss. Boo.